For most of us, the closest we’ll ever get to wildlife is perhaps the local zoo, a kiddie safari adventure park or maybe even while channel-surfing on Discovery Channel. Sure, as humans we often receive invitations to get up close and personal with others from our species at gatherings like baby christenings, marriage ceremonies and retirement parties. But in the animal kingdom there is no request for your presence—unless you’re kin or perhaps someone’s very next meal. Beyond our own kind, we have always been curious about the world around us. And as film technology has advanced, it’s no wonder that G-rated wildlife documentaries have increased in popularity, and production, over the last few years: March of the Penguins, Earth, Oceans, Born to Be Wild, African Cats. The narration is compelling, the stories are enlightening and the cinematography is always breathtaking and filled with “how did they do that?” type of shots and unbelievable moments. Turtle:The Incredible Journey is no different. Released by Hannover House and SeaWorld Pictures and narrated by Academy Award® nominee Miranda Richardson, this 80-minute wildlife documentary shows us what it’s like to be a loggerhead turtle (classified as "endangered" in the IUCN Red Book) and why a lifetime of swimming on a voyage that can span the entire Atlantic Ocean is what this amazing reptile was born to do. Award-winning director Nick Stringer (National Geographic Explorer), a biologist turned filmmaker, takes us closer to these turtles that begin their lives buried alive on the beaches of Florida (about 1.6 feet down in the sand) and spend three days digging themselves out before reaching the surface. No bigger than the palm of a child’s hand, the loggerhead still has a way’s to go and some menacing predators to avoid before it reaches the ocean to begin its 20-plus year migration before returning to the place of its birth. From the beach to the Gulf Stream to the Arctic and ultimately around the entire North Atlantic and back, this 9,000-mile adventure guided only by instinct is all captured in many powerful and emotional sequences in Turtle: The Incredible Journey, which releases Friday, June 24, 2011 in select cities (and is available in 3D in some markets) before expanding on July 1 and July 8. I spoke recently with Nick Stringer and asked him to share more about what went into the making of this wildlife documentary and why he felt the story of the loggerhead turtle’s incredible journey needed to be told. How did you decide to focus on the loggerhead turtle as opposed to maybe another type of endangered creature for this wildlife documentary? The story of the loggerhead is an exceptional story in the animal kingdom. Loggerhead turtles have been around for more than 200 million years since the age of the dinosaurs. Their story is a remarkable story, and the loggerhead story begins from the day it’s born. It reaches out from its shell, climbs up onto the beach and in the span of one day it’s already begun its journey and its struggle for life. It’s a 20-year journey around the Atlantic. And there are very few journeys like that. It’s also kind of a canary in the ocean. Its story is kind of symbolic of what is actually happening in the ocean today and all the impacts of fishing, of oil and some of the effects that we have on marine life are very, very clearly seen here in the turtle story. So for me it was just an obvious one and one that I’ve been enchanted with for the last 20 years and was glad that I had a chance to tell that story. I’m assuming you had to film different turtles since you only had two years to make this documentary. And you couldn’t possibly follow around the same turtle for 20-plus years. So how did you show the loggerhead at different stages of life to represent one turtle's journey? Absolutely. We couldn’t wait 20 years to wait to tell the story of one turtle following it around the Atlantic. That would be impossible. And we can’t wait 20 years to hear the turtle’s story because their way of life is in danger, and the story needs to be heard and seen now. So the way we did it was we took a leaf out of Hollywood’s book and used a number of different “actors” playing the same character, and we probably ended up filming about 10 or 15 turtles at different stages of the turtle’s life cycle. It’s still the same story for all of them. They all fundamentally do the same thing; they all go around the North Atlantic and follow the same path. So I think it’s quite legitimate, and hopefully we’ve ended up telling a very beautiful story. A lot of Crosswalk readers are parents who are concerned with the education of their children, and the study of God's creation is a big part of that. As the director of Turtle: The Incredible Journey, what do you think children will be able to learn from this documentary? The few children who I have met who’ve seen it have loved it. I’ve been really heartened by the fact that so many young children do like this film. I think what it is is it’s a real story of a sea turtle and it’s an adventure, but it’s also hugely revealing, I hope. It just shows a little of what it must be like to be a turtle in a huge, vast ocean. And it does give us perspective, I hope, on what’s actually happening in the oceans today. I’m sure children will come away with a lot when they view this film. The ones that I’ve met so far have, and it’s been a delight for me to see. It’s something I really, really wanted to do when I made this film at the outset was that I wanted it to appeal to children not just because it was entertaining, but also because I hope that there is something of an underlying message. And it’s the kids really who are our next generation; these are people that have to carry the torch of protecting the environment and they are the future generation. So that was very much at the front of my mind when I made this film. 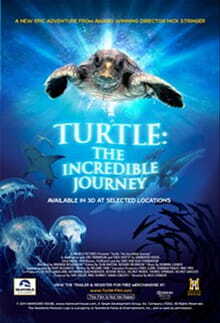 The film portrays that there are both natural obstacles and man-made obstacles that get in the way of and threaten the turtle’s journey. Do you think that one set of obstacles is more to blame than the other for what has made the loggerhead “endangered”? Yes. I mean all sea turtles have their different challenges. The loggerhead turtle is a turtle that goes on a voyage across the ocean into waters, and they start their journey in Florida across the North Atlantic across the ocean almost to Africa. So they’re going through a lot of territory and they’re exposed to a lot of the problems that mankind throws at them, and that is long-line fishing. We’re talking about plastics, and we’re also talking about habitat. So a lot of these are man-made problems and are problems for turtles. And they are probably entirely responsible for the fall in numbers that we have witnessed in the last 30 or 40 years. The sea turtles are in trouble, and they need our help. It’s important that we get the message out there that we do what we can to protect them. And I’m pleased to say that in the U.S. they’re very aware, and there have been a number of policies that have been introduced there that have helped to protect these turtles and protecting beaches, etc. It includes changing long-line fishing practices from the traditional “J hook” to a curved hook. It includes changing shrimp netting, etc. There’s so much that’s being done here in the U.S. You just want that to kind of filter out to other countries, so that we can protect [sea turtles] internationally. In the narration, there’s a statement that loggerheads have been around for more than 200 million years, which implies that the age of the earth is that old. For people who have a different worldview or belief system and don’t agree with this assertion, can they still enjoy the film and take away something from it? Absolutely. I think that nature and all its beauty is seen in this film, and I was lucky enough to be in the water when we filmed some of the sequences. And it never ceases to amaze me just how stunning and beautiful the oceans are. The turtle’s journey is a story of an individual that has to make it on a 20-year odyssey and the chance of its survival are just one in ten thousand. You’re rooting for your character the whole way, and you want it to succeed. It’s an individual you can’t help but want to support. So it’s a story of a single animal and its challenges in the ocean, and it’s an adventure of a real kind. What kind of challenges are unique to making wildlife documentaries that the average moviegoer may not know about? When you’re making a movie for Hollywood, you start with a script and by and large you stick with it. When you’re making a wildlife movie, that script tends to get torn up quite quickly—because nature, as we all know, is full of surprises. And so when I make a wildlife film, I go in with a broad idea of what I think the story will be, but I think you have to be incredibly flexible as to how that story is actually twisting and turning before your eyes. So the storytelling is actually told afterwards in the [editing process]. So that’s one very big thing. The other is time. The amount of time you have to put in to trying to capture wildlife behavior. To give you an example, we wanted to film the mating sequence for the loggerhead and it took us three weeks on the water before we even saw a mating couple. And it wasn’t until the last day of production, the last hour of production, that we actually filmed the mating sequence. I think it’s also the time that goes into actually trying to capture these things of nature. And then crews. Feature films have got huge, huge crews. With wildlife [documentaries], you’re often only working with five or six people. And you depend very heavily on your underwater cameramen, because they have remarkable skills and they have an incredible sensitivity toward wildlife. They understand their behavior and how they move, and they’re able to get close and actually record them doing what they do in the wild. And that’s a very, very specific skill. And you rely on it heavily as a wildlife filmmaker. Speaking of getting close, would you talk about the miniature Hi-Definition cameras you used in the opening sequence of the baby turtles poking through the sand and desperately trying to get to the ocean? It’s something I really wanted to do was to immerse in the turtle’s world, get down on its level and really get a sense of what it must be like to be a little loggerhead turtle and being on that beach for the first time. These are some very high-tech miniature cameras that the lines get right down on their level, and they track the land of the beach and these little turtles are only the size of a child’s hand. We can track them along the beach with these little cameras that just breathe the action and the immediacy of the scene. So we spent a lot of time finding the right technology, deciding on the right cameras to use, and finally settled on a camera that really, really delivered. And so I was very happy with the result. You also used some visual FX and shot some recreations in specially built marine studios. Why did you have to do that? It’s essentially about 80 percent of the film was shot in the ocean and about 20 percent we had to film in the studio. We know we can find loggerhead turtles in certain places in the Atlantic Ocean, and we know we can find them in Florida and the Azores and the Caribbean but trying to track one across the North Atlantic is incredibly difficult to do. So in order to tell a story we needed to fill in the gaps in some places, and so we had to fall back on filming in a studio. But all the turtles we filmed were turtles that had either been rescued or rehabilitated and they’ve all since been released back into the wild and into the ocean. So yes, there were scenes that we had to shoot in a tank. But I think it was necessary to tell the story. I believe that it’s very important that we do get the story out, and I think it’s certifiable. The sound in this documentary really lends itself to the emotion and the experience—from the score to the narration to the sounds of nature. Do you think that sound plays a big role in helping the audience connect with what they’re seeing? Yes, I do. I think it’s really important. I think the sound is something that we worked very, very hard on and we recorded a lot of sounds in nature where we were and I think that it was used to great effect. But it’s something that does add a sense of being there, a sense of the atmosphere, and it’s absolutely critical. There’s one scene where the cargo ship is barreling down on the turtle and you can hear it approaching from a distance, and it’s just those subtleties and twists and turns and I think get you down on such a sort of micro level. How does the addition of 3D further enhance the film? I think it brings you one step closer, I would say. It’s one step closer to full immersion. I was deeply impressed when I saw it. It does help take you there. But you know equally important to me was the story, and that was something that I cared very much about and I really wanted that story to be right. And quite often you don’t get so much focus on story, but all the focus on spectacle. And I hope what we have here is a combination of the two. Why do you think wildlife documentaries such as Turtle: The Incredible Journey that give up-close-and-personal glimpses into the natural world are gaining so much popularity, and even sometimes becoming family movie-going events? I think the reason we’re seeing so much is probably because of March of the Penguins . It sort of kicked it all off. It’s the first time a wildlife film has caused so much of a stir. And I guess there just must be a demand for it. But at the end of the day, the natural world and its creatures look fantastic on the big screen. It’s a natural place for it. For me, it’s about getting the right story and telling the right stories so that people aren’t just coming to see beautiful images of the natural world, but there are important stories being told now. More than ever [audiences] need to hear those stories, so that we can actually protect our wildlife and for future generations. Are you working on a next story right now or another wildlife documentary? I’m just in the throes of finishing a film about great whites, I’m pleased to say. That is due to be released on Discovery Channel during “Shark Week” at the end of July. So we’ve just literally finished that. For more information about Turtle: The Incredible Journey, please visit www.turtle-film.com. Every baby turtle begins its life buried alive, approximately ½ a meter (1.6 feet) down in the sand. They spend three days digging to reach the surface. Baby loggerhead turtles are no bigger than the palm of a child’s hand. Nearly 2 million loggerheads are born on the beaches of Florida each year. Only 1 in 10,000 loggerheads make it to adulthood. The survival of loggerhead turtles is threatened by many things, including: predators, pollution, loss of nesting area due to property development and long-line fishing. Every year tens of thousands of turtles die due to long-line fishing. More than one billion long-line hooks are cast into the sea every year, causing the death of turtles, sharks, dolphins, sea birds and other sea animals. Sea turtles undergo one of the longest migrations of the natural world, returning to the beaches where they were born to lay their eggs. Loggerheads lay on average around 100 eggs at a time. Loggerhead turtles can grow up to 800 lbs. and 3.5 feet long. Adult loggerhead turtles are 6,000 times larger than their hatchlings. Loggerheads can swim at speeds of up to 15 mph. Sea turtles are one of the oldest living reptiles. Loggerheads have been around for more than 200 million years. A female loggerhead tracked at sea made up to 500 dives every 12 hours.